A beautiful hard and soft package that just works. Hugely expensive but once you're hooked, worth it. Simple new software. Gorgeous new hardware. Innovative new features. Hardware controllers are very expensive. When NI announced Komplete Kontrol, an innovative way to browse and edit the sounds resident in its world famous plugins, we gave a little wince. We always quite liked NI's Kore and gave it the benefit of the doubt on the strict understanding that a) It often 'got in the way' when you wanted to do proper tweaks b) It never really made good on its promises. So it's admirable that NI has remained attached to this 'one software to rule them all' ideal because - at its 'kore' - it's a good idea. Instead of searching through each plugin for a specific sound you can browse all your 'bass' tones at once. What does it matter if the sound comes from Absynth or Massive anyway? And if you do want to specify a specific synth you can. Easily. Rather than walk away from the 'koncept' NI is back with another stab. And this time it's got it right. "All Komplete's sounds are accurately categorised and everything makes so much more sense than NI's R.I.P. Kore system"
This time their 'super synth' is a game of three parts and each makes a lot of sense. Firstly there's Komplete, NI's popular super-suite of software that in version 10 feels more unified and consistent than ever. Next is Komplete Kontrol, a free bit of software for Komplete 9 or 10 owners that sits in front of the individual plugins and gives a simple unified interface. And finally there's the Kontrol S keyboards, a new set of controllers specifically designed to work with Komplete Kontrol and which come in 25, 49 or 61 key forms. Okay, so let's talk Komplete Kontrol first. Komplete Kontrol finds the plugs and presets installed by Komplete and allows you to browse all of its sounds, edit important elements with a trimmed down version of the full plug's interface and generally do all the stuff that matters from one simple-looking plugin. You can search for 'pad sounds' (for example) via search criteria and pull up a list of options regardless of the plug that makes them. It's a standalone or plugin (appearing in your NI folder in your DAW's drop-down) and it works great. It's simple, easy to understand and pretty fast, given that tapping through sounds requires your computer to load up each plug and sound to let you hear it. Locking the search to a particular plugin speeds things up further but rather rubbishes the 'one plug searches all' concept. All Komplete's sounds are accurately categorised and everything makes so much more sense than NI's R.I.P. Kore system. There's no spurious 'sound morphing' features, unwanted effects and mixer sections or buttons you don't understand (or use). And the software feels clean and nimble enough for you to confidently have it between you and your NI plugs without any fear that it's slowing down your computer or dumbing down your synths. It might be that you never open the full plug again and we can see a Komplete 11 (12? ...13?) where this single interface truly becomes the front-end of Komplete's gamut of power. So it's slightly confusing as to why Komplete Kontrol is being made available for free. It would make more sense to include it only with the Kontrol S as the keyboard is next to useless without it and - at those prices - needs all the help it can get. We can see lots of Komplete users cheekily enjoying Komplete Kontrol with no intention of ever buying a Kontrol S and giving NI any more money. Still, it's their call. "The keybed is made by Fatar so the feel is precise, light and definitely 'synthesizer' but sturdy with a smoothly weighted touch"
Attach a Kontrol S keyboard to Komplete Kontrol and things simply get a lot more tactile. The Kontrol S is styled identically to NI's Maschine Studio and the pair will immediately strike a chord with anyone who cares about their studio's ergonomics. Seriously, if you own one you will lust after the other. The plastic is matte and soft to the touch and the metal surfaces are brushed and (literally) cool. Knobs are identical to the smooth dials on the Maschine Studio and the whole thing is solid enough to feel premium but light enough to sling around. Browsing sounds, setting search criteria and tweaking parameters can all be done from the keyboard's controls and it's easy to start thinking about Kontrol S as the most powerful synth you own rather than an 'empty' box. The keybed is made by Fatar so the feel is precise, light and definitely 'synthesizer' but sturdy with a smoothly weighted touch allowing fast playing and accurate dynamics. After five minutes we loved it. Kontrol S's eight built-in screens give vital information as to what each knob is about to do before you turn it and where that parameter is set. Eight parameters for every sound automatically appear on the keyboard and page left and right buttons take the knobs deeper into more obscure functions. The concept is similar to Novation's ground-breaking SL keyboards which used tiny screens (albeit at lesser quality) to do the same thing. 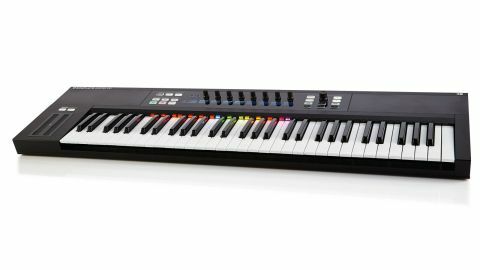 Kontrol S's Light Guide - a system of coloured LEDs above the keys that aims to show you 'what a key will do' before you hit it - is a real unique selling point. The exact use for the lights system changes depending on what you're doing but broadly speaking it shows the position of sounds across the keybed and/or notes and scales selected in the keyboard's unique chord and arpeggiator modes. And in a studio's half light it just looks cool, with the length of the keys more often than not bathed in a cool blue. And finally there's Kontrol S's unique mod and pitch 'wheels', replaced by two touchstrips with LEDs showing levels. At their simplest these are faders allowing you to drag a finger up to the desired height but their use as a touch surface allows a player to tap at different points and toggle between extreme settings instantly in a way that a wheel could never accomplish. Alternatively (via various modes in the Kontrol software) a player could set an effect modulating up and down with inertia based on how fast you pushed the strip, touchscreen style. Just the job for wobbling the LFO on your basslines or going modulation and bend crazy while still having your hands free to play. Caution to the wind and wallet rinsed and you've got a very new and sleek way of putting sounds in your DAW. For this review (more by circumstance than intention) we installed Komplete 10, Maschine and Komplete Kontrol on a new fast Mac with Logic. The result - tens of thousands of sounds we can select and manipulate in a consistent way that we really like and understand - has really made us wonder if we should even bother installing anything else. But like all cool, expensive stuff, you can of course simply choose to live without it. A Bentley is just a car after all. But we think that once you've test driven Komplete with Komplete Kontrol and Kontrol S in the driving seat you might well part-ex your banger.